The Green House was started in 2007 to bring together "an environmentally conscious community of students from all academic disciplines linked by the common pursuit of sustainability." Their mission is: "As an environmentally themed community, the Green House serves as a hub for people who value environmental awareness in their living space. Through several collaboration efforts with other offices on Lehigh's campus, The Green House hopes to bring a feeling of respect and maintenance for our natural resources." Students focus on reducing material waste and energy expenditure in their personal and social habits, as well as promoting green living at Lehigh. 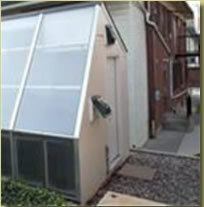 Green House is an on-campus residence located in Warren Square A.